Yes, that substrate in the photos is what you think it is. Deconica argentina, like its better-known cousin Deconica coprophila, is "coprophilous," meaning it pops up in piles of dung—usually the dung of horses or cows. Mmmm, mmmm, mmmm. If you know these mushrooms, you really know your $#!t. Deconica argentina is small, and its convex cap is adorned with whitish veil remnants when young. Its somewhat shaggy stem does not feature a notable ring or ring zone. Under the microscope it has large, hexagonal-ish spores, lageniform cheilocystidia, and an ixocutis. All of these features also apply to Deconica coprophila, but the latter species has somewhat smaller spores and is a denizen of tropical and subtropical areas. Deconica argentina is found in temperate regions, in mountains, and towards the two poles. 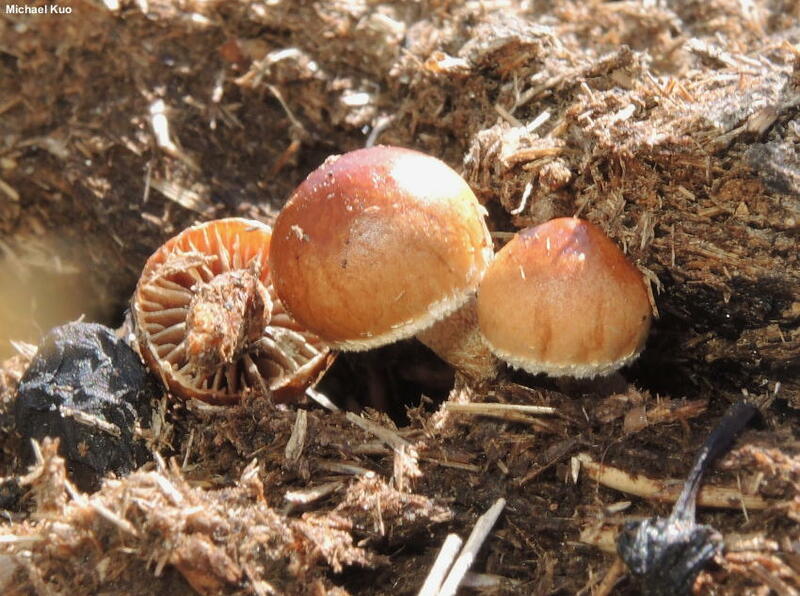 Both species have been placed in the genus Psilocybe for decades—but DNA studies (for example Ramírez-Cruz and collaborators, 2013) make it clear that the non-bluing species of "Psilocybe" are actually not as closely related to the bluing species as mycologists thought; the two groups may not even belong to the same family, let alone the same genus. For those who really want to get their hands dirty with this group of species (yuck) and who rely on Noordeloos (1999) for identification, he appears to have misread Guzmán's (1983) monograph, citing Guzmán's Psilocybe argentina description as a treatment of Psilocybe merdicola. 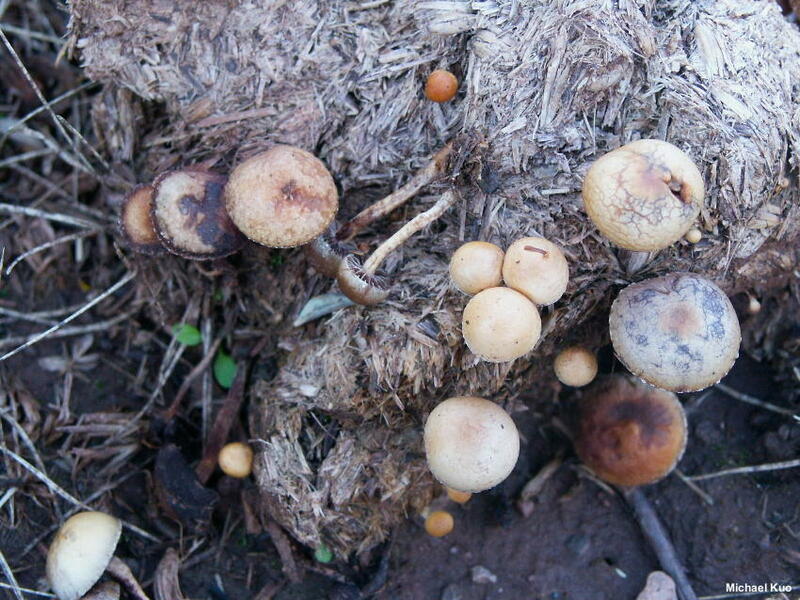 However, while Guzmán, probably mistakenly, cites Psilocybe merdicola as a synonym of Psilocybe argentina, his very thorough description, which Noordeloos must not have read, calls for a species with subhexagonal to subrhomboid spores and a stem "without any annulus or remains from the veil"—not at all like the species with ellipsoid to oblong spores and a "more or less distinct fibrillose annuliform zone" Noordeloos describes for Psilocybe merdicola. 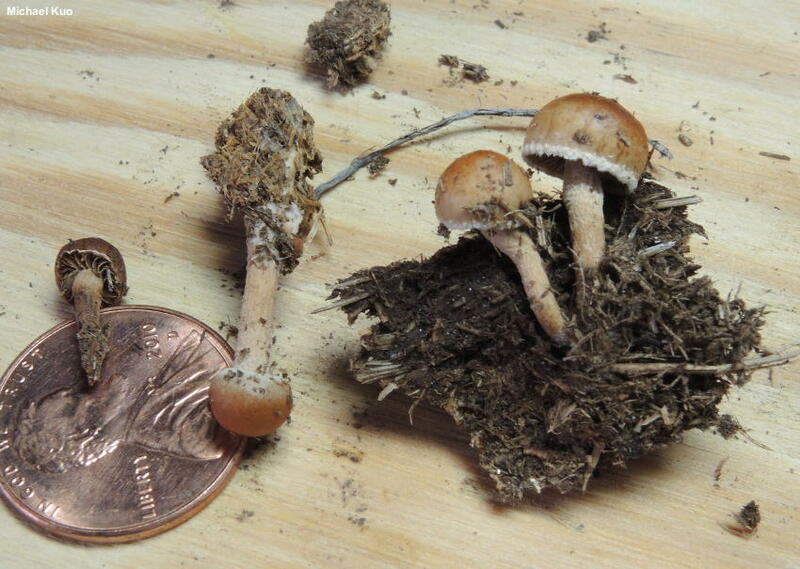 Using Noordeloos, Psilocybe/Deconica argentina would key out to Psilocybe coprophila, but would have spores longer than the described 10–14 µ range. Other European authors (e.g. Vesterholt, 2008) may have uncritically followed Noordeloos, leading to the disappearance of Deconica argentina in European treatments. Ecology: Saprobic; growing gregariously or in loose clusters on the dung of horses and cows in meadows, sunny areas at the edges of woods, and so on; probably to be expected throughout montane and northern North America; summer and fall. The illustrated and described collections are from Colorado. Cap: Up to 3.5 cm across; convex at first, becoming broadly convex; sticky when fresh, but soon glossy and dry; bald; reddish brown to orangish brown, fading to yellowish brown or yellowish; sometimes developing cracks in the pigment in old age, resulting in a mosaic-like appearance; the young margin ringed with whitish, fibrillose partial veil remnants that sometimes remain as tatters as the mushroom matures. Gills: Broadly attached to the stem; distant; short-gills infrequent; pale to medium brown, with contrasting whitish edges. Stem: 1–3 cm long; 2–4 mm thick; equal; dry; finely hairy or fuzzy; whitish, discoloring brownish; without a ring or ring zone after the veil breaks; basal mycelium white. Flesh: Brownish; unchanging when sliced. 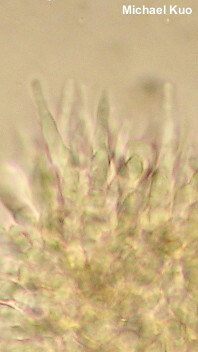 Spore Print: Dark purplish brown (Guzmán 1983). 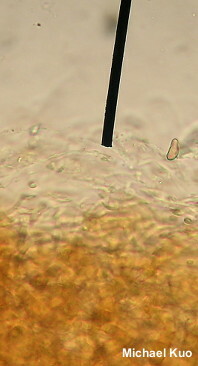 Microscopic Features: Spores 13–18 x 7–10 µm; elongated-subhexagonal; smooth; with a large pore; thick-walled; brown in KOH. Basidia 4-sterigmate. Cheilocystidia 35–45 µm; fusiform-lageniform; smooth; thin-walled; hyaline in KOH; abundant. Pleurocystidia not found. Pileipellis an ixocutis of elements about 2.5 µm wide; elements smooth, yellowish to orangish brown in KOH. Clamp connections present in contextual hyphae. REFERENCES: Spegazzini, 1899. (Guzmán, 1983; Noordeloos, 1999; Ramírez-Cruz et al., 2013; da Silva et al., 2014.) Herb. Kuo 08041703.